The style that was in service for almost 20 years. There were many of these in service all over Winsenburg. With their orange front bumpers and doors. These series feature plastic seats with orange fabric. The busses were repainted to the new modern style in 1999, a year before the first Citaro went into service. The last, high floor bus series in service. In 1999 repainted and re-fabriced to the new [Sta:Win] style. 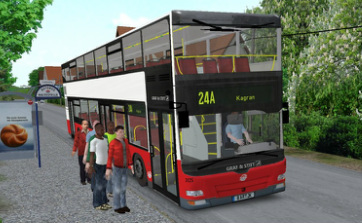 The last bus went off service in 2002, making the fleet of Winsenburg fully low floor. In a town where the economy rests mostly on the Mercedes-Benz plants, the solaris busses are a bit out of the ordinary. But European public tenders made the Sta:win order the polish busses. 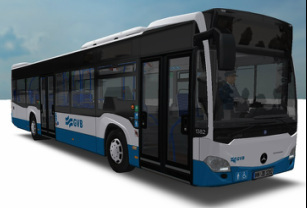 The Urbino 12 is a citybus in every aspect. 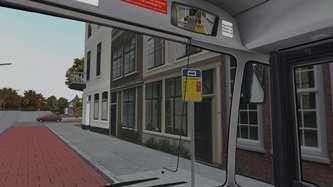 It has a wide interior, two double doors and some other citybus things. But the most important of all, the paint is the same as other Sta:Win busses. So who cares! Oh and the bus has wifi, so have fun driving it! 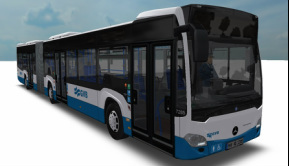 To increase passenger comfort, Sta:Win also ordered Low entry models for the longer bus lines. These busses have more seats, out swinging doors and a full front wind shield. Not so suitable for the busy lines. The new C2 solo busses will be present on the fourteen citybus lines and are similar to the (old) O530 busses. The gray and orange colours and the gray dot's aren't changed. But these new C2 busses will feature some extra details like the back of the seats are coloured orange, the flour has some small orange dots. This all adds to the brand colours and give the bus a unique look and feel. The fourteen citybus lines will be driven by 2-door solo busses. These busses can be recognised by the dark-gray front and the full-orange sides with gray dots. Included are also three custom ads on the back side of the bus for extra realism. The same style as the solo bus. But longer. 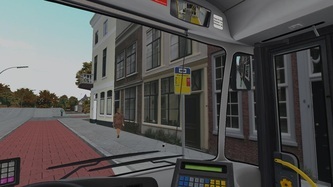 This bus comes with the same level of detail as used in the solo C2 bus. The same style as the solo bus. But longer. 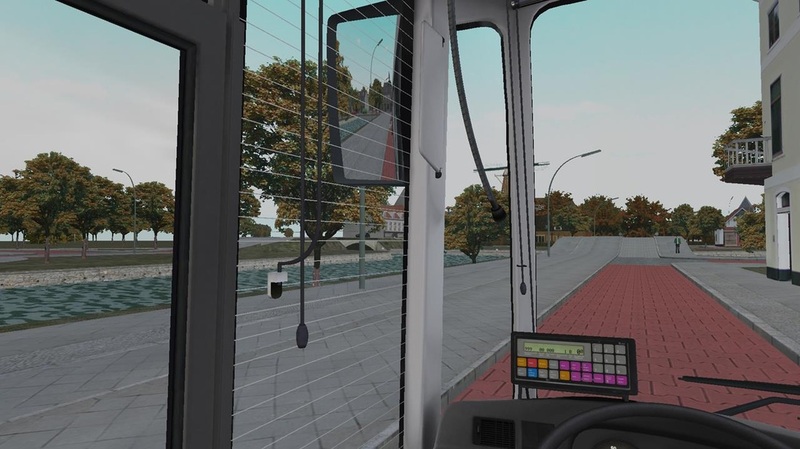 This bus isn't used in the ai list because the articulated busses can be buggy sometimes. 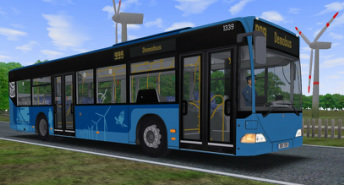 But as player you can use this repaint for the citybus lines. This bus only comes in a normal version without ads on the back. 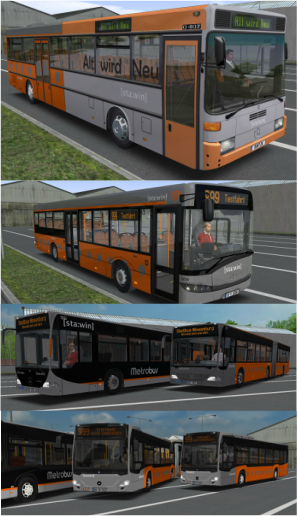 For the eight nightbus lines in Winsenburg you can use this repaint. The interior is the same as the other standard citybusses. The outside is still recognizable by the gray and orange colours, but the blue colour on the side clearly shows the difference between a normal bus. The gray dots on the side are darker and there is a big "Nachtbus" logo on the side in the same style as the metrobus. Perfect for your midnight road trips. 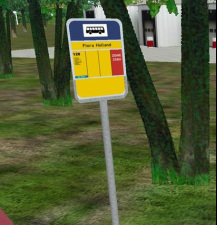 Unfortunately is the AI not using this repaint on nightbusses because they don't have a separate ai group. So this repaint is also only for the player. The same style as the solo nightbus but longer! Till 1997, Winsenburg had two express-bus lines. These were high comfort, quick connections with the city centre. The local government introduced them to make the city centre more attractive for the surrounding villages of Winsenburg. In 1997, the bus company decided to convert those two lines in to normal bus services. This meant that the 10 Express-busses were combined in normal service. In 1999 the 10 busses were repainted with the advert campain "Alt wird Neu". At the end of 2000, they reached their life cycles and were put out of service. One and a half year later, the Metrobus network was introduced as the successor of the Express-bus. To make the new style familiar to the public, the 10 Express busses were painted in an "Alt wird Neu" advert campaign to let the public know that the bus company didn't change. The front part of the bus was completely in the old [Sta:Win] style, but the rear part of the bus was painted in the new modern style. Even the luxury coach seats were half old style, half new style. Ordered as backup busses, they aren't that suitable for the metrobus lines. 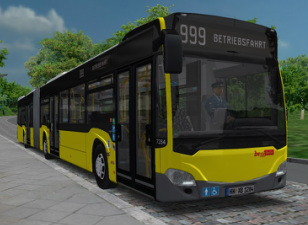 It is basicly a citybus with another colour. But you love it when the other busses break down. If you need to pick a 12 meter bus, pick this one. It has the most seat capacity and is the most comfy to! It's the perfect solo metrobus, great for late night trips or sunday evenings! Your passengers will like it. The five metrobus lines are the biggest link in the bus network of Winsenburg. In order to make them stand out from other busses, they've got their own repaint. The repaint is still recognizable by the gray and orange colours but it's the black colour that give this repaint an express look. 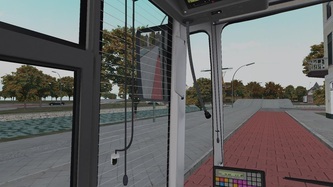 The C2 busses have got a luxury interior with wooden parquet floor, black headrests on the seat that matches the seat colour better, orange line on the back of the seat to accent the metrobus style, custom stickers on the exterior and interior and StaWin advertising. It's the perfect expressbus! The solo version of this bus isn't the first pick on these lines but are a great addition on the less busy lines in evenings and at night. The five metrobus lines are the biggest link in the bus network of Winsenburg. In order to make them stand out from other busses, they've got their own repaint. The repaint is still recognizable by the gray and orange colours but it's the black colour that give this repaint an express look. It isn't as luxery equipped as the C2, but hey, it got Wifi! The five metrobus lines are the biggest link in the bus network of Winsenburg. In order to make them stand out from other busses, they've got their own repaint. The repaint is still recognizable by the gray and orange colours but it's the black colour that give this repaint an express look. The C2 busses have got a luxury interior with wooden parquet floor, black headrests on the seat that matches the seat colour better, orange line on the back of the seat to accent the metrobus style, custom stickers on the exterior and interior and StaWin advertising. It's the perfect expressbus! The articulated version is the most common version on the metrobus lines because it had the most capacity. The five metrobus lines are the biggest link in the bus network of Winsenburg. In order to make them stand out from other busses, they've got their own repaint. The repaint is still recognizable by the gray and orange colours but it's the black colour that give this repaint an express look. 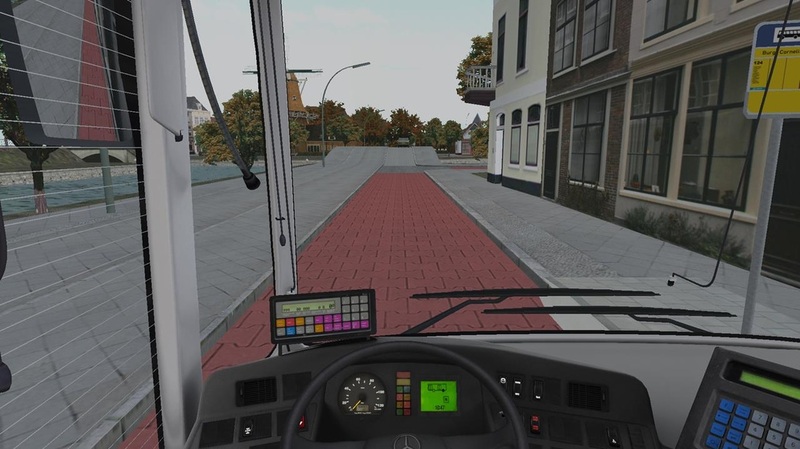 The bus has an orange belt that goes around the whole bus including the articulated part. On the front, back and the side of the bus there is a "Metrobus" logo. The windows have a black tint to match with the black parts of the bus. The front door doesn't has this tint so the driver's view isn't blocked. The metro busses have a different interior than other busses. The seats have black and orange accents. 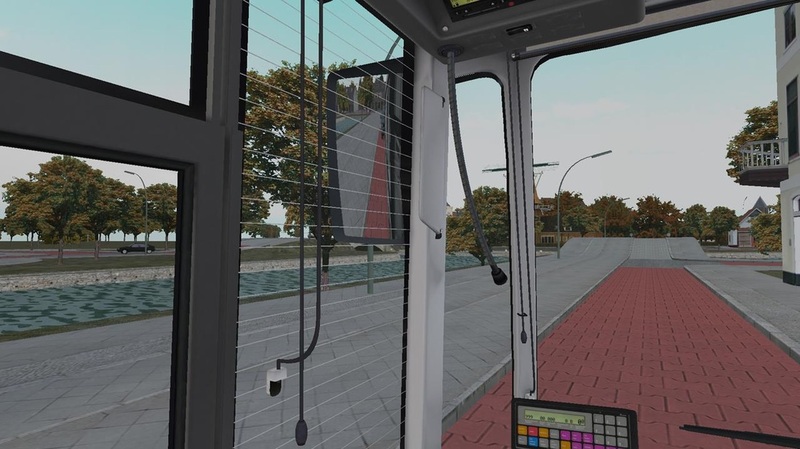 The repaint is used by the AI on all metrobus lines. So there are many versions to use and there is a suitable repaint for every line in Winsenburg =D. Licence information can be found in the download or on this site under the licence link. User "Marc1972" has made a fix for the repaint bug. Kudo's to him!! And you're done! Again, all credits go to Marc1972. All files are required in other to use the map. If you use omsi 2, please only download the files of omsi 2. Downloading any files of omsi 1 may cause errors. problems with opening the map? these steps are in general a solution for random problems in omsi 2. If this didn't work, please contact me. To make the interrior repainteble, you should do the following (If you did this before. There's no need to do it again)Go to the models map of the lion's city DD and open "model_DL05.cfg".